15 ml (1tbsp) chopped bacon + 30ml (2 tbsp) cubed cheddar. Thinly slice mushrooms & onion & use approx. 15 ml (1tbsp) of each + 15 ml (1 tbsp) grated cheese. 20 ml (1.5 tbsp) chili + 30 ml (2tbsp) grated cheese. 2 slices mozzarella cheese + 15 ml (1 tbsp) tomato sauce + 3 slices pepperoni. – 45 ml (3tbsp) steak sauce. Filling: 250 ml (1 cup) Swiss cheese, cubed. Instructions: In a large bowl, mix the ground meat with horseradish & steak sauce. Divide into 4 equal portions. Pat one meat portion (keeping about 1/4 of this meat portion aside for sealing the cavity) into a Burger Press. Using the press, make a cavity in the patty. (Or shape a burger into a small cup, by hand). Fill the cavity with 1/4 cup of the cubed cheese. Seal the patty with the reserved meat and press into a neat burger patty. Repeat with the next 3 portions. Cook each burger 5 to 8 minutes per side until well cooked (test for doneness). Serve on a toasted bun. 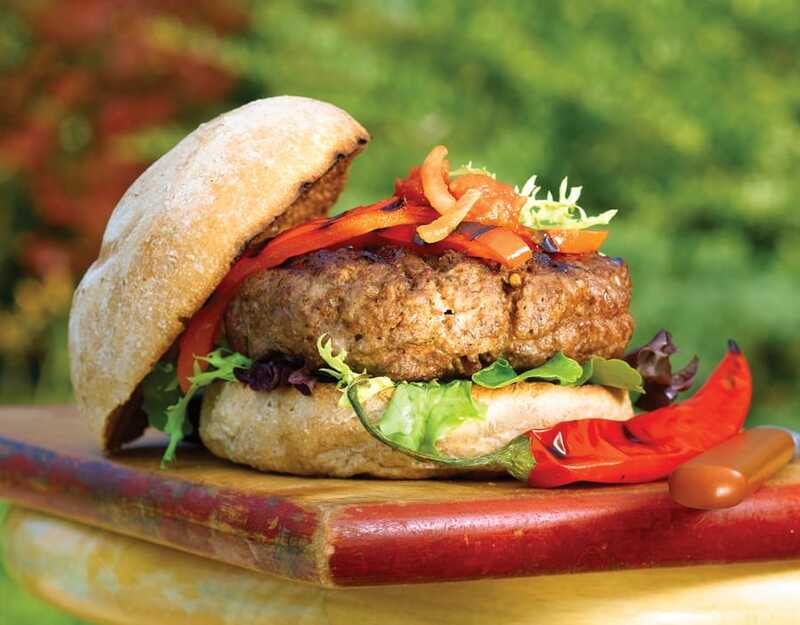 Instructions: In a large bowl, mix the ground meat with the Gourmet Village Burger seasonings. Divide into 4 equal portions. In a small bowl, mix together the cheese and the Topping for Cheese. Pat one meat portion (keeping about 1/4 of this meat portion aside for sealing the cavity) into a Gourmet du Village Burger Press. Using the press, make a cavity in the patty. Fill the cavity with 1/4 of the cheese mixture. Seal the patty with the reserved meat and press into a neat burger patty. Repeat with the next three portions. Cook each burger 5 to 8 minutes per side until well cooked (test for doneness). Toasted or not, use any kind of bun; panini bun challah bun, naan bread. Filling: Cranberry Orange Cheese Topping + shredded sharp cheddar cheese. Filling: Red Pepper Jelly + shredded mozzarella cheese + grated parmesan cheese. Filling: Sweet Onion Cheese Topping + shredded mozzarella cheese + crumbled blue cheese. Filling: Apricot & Jalapeno Cheese Topping + shredded Monterey Jack cheese.